In May 1940, the British War Cabinet debated over the course of nine meetings a simple question: Should Britain fight on in the face of overwhelming odds, sacrificing hundreds of thousands of lives, or seek a negotiated peace? Using Cabinet papers from the United Kingdom’s National Archives, David Owen illuminates in fascinating detail this little-known, yet pivotal, chapter in the history of World War II. Eight months into the war, defeat seemed to many a certainty. With the United States still a year and half away from entering, Britain found itself in a perilous position, and foreign secretary Lord Halifax pushed prime minister Winston Churchill to explore the possibility of a negotiated peace with Hitler, using Mussolini as a conduit. Speaking for England is the story of Churchill’s triumph in the face of this pressure, but it is also about how collective debate and discussion won the day—had Churchill been alone, Owen argues, he would almost certainly have lost to Halifax, changing the course of history. Instead, the Cabinet system, all too often disparaged as messy and cumbersome, worked in Britain’s interests and ensured that a democracy on the brink of defeat had the courage to fight on. 2 In the Name of God, Go! "David Owen has thought deeply about these issues—and is always worth reading." "David Owen, from his wide political experience, throws new light on those dramatic weeks in May and June 1940 when Winston Churchill stood bravely against the mighty Nazi threat to Britain. Lord Owen also emphasises the crucial roles played by Labour’s Attlee and Greenwood in resisting pressures to negotiate with Hitler and Mussolini, and above all the importance of our traditional British Cabinet government, which supported Churchill against the German Blitzkrieg. 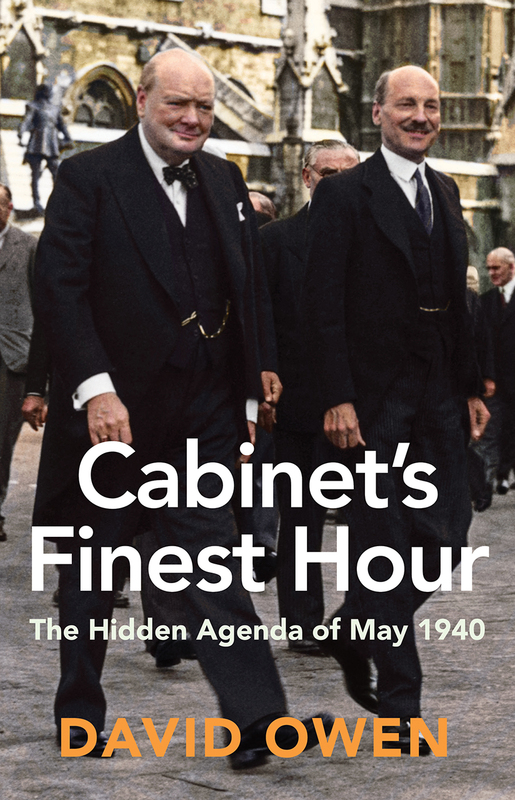 His book, Cabinet’s Finest Hour, is a fascinating read."